The Details: Slayers is a series that starts off seeming juvenile and then almost as quickly becomes too funny and interesting for it to matter. Better yet, anything overtly juvenile about it fades as the plots convolute and convolute and... Well, until it reaches a point where, thankfully, there is no longer any such thing as good guys and bad guys. If there ever were any to begin with. Lina? A good guy? Feh! She would probably kill us for even thinking it! Not that we would think it anyway. My favourite character is Xellos, evil god of the "I'm no one suspicious, I'm just a mysterious priest" line. Yeah, don't mind him... If only his impish pranks were all there were to him, the crew's lives would be easier. My next favourite is Zelgadis, the moody and easily embarrassed stone-human chimera. I've been fortunate enough to find dream cels of both of them, though there are plenty of others I would love to find (of course). I adore most of the characters, though, and hopefully I'll eventually have a diverse enough collection to cover all of the good ones. 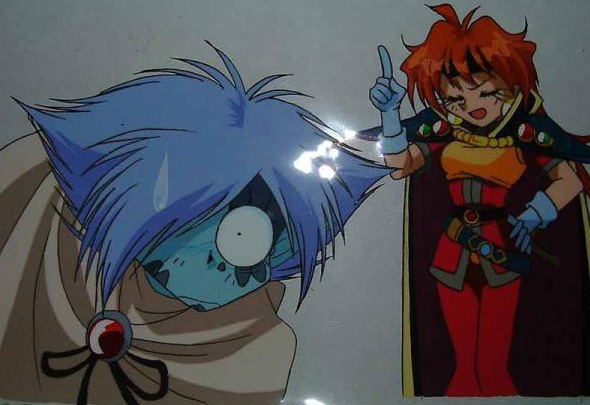 Until then, the break-downs will be the usual gang of Lina, Gourry, and Amelia, plus the not quite as usual tag-alongs of Martina, Filia, and Zangulus; the less not-as-usuals; the group moments; and any other reasonably sized clumpings. Naturally, Xellos and Zelgadis have their own obsessive sections.